Liverpool travel to West Ham United tonight, with both sides hoping to claim a victory in their FA Cup fourth-round replay to move a step closer to Wembley. Both sets of fans will be hoping for excitement after the drab goalless draw on Merseyside ten days ago. A trip to Blackburn Rovers awaits the winner in the next round. The Hammers, who are currently sixth in the Premier League table, still have hope of qualifying for the Europa League. They may see the cup as another opportunity to host European football at the Olympic Stadium next season. Slaven Bilic’s men will be looking to bounce back from a bitterly disappointing 1-0 defeat to Southampton, despite having a man advantage for 40 minutes and 65% of the possession. Meanwhile, the Reds will be looking to hit some form prior to their Capital One Cup final against Manchester City at the end of this month. Jurgen Klopp’s side have been inconsistent of late. They surrendered a two-goal lead against relegation strugglers Sunderland at Anfield on Saturday; with many of the fans vacating the stadium in the 77th minute over the dissatisfaction at the increase of ticket prices. West Ham have problems at right back. Makeshift cover James Tomkins is ruled out with a calf injury sustained at St Mary’s on Saturday, while Sam Byram is cup-tied having played in the third-round for Leeds United. Joey O’Brien is likely to come in for his first start of the season. The visitors will have striker Daniel Sturridge available, after he returned to the bench during his side’s draw against the Black Cats at the weekend. Elsewhere; boss Klopp is expected to make wholesale changes to the squad, with youngsters Jordan Ibe, Brad Smith and Joao Teixeira all looking to start. 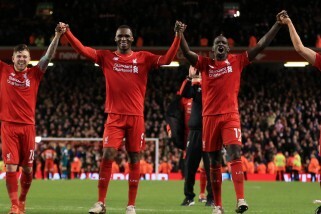 Christian Benteke is likely to play up front, having appeared in all of the Reds’ FA Cup fixtures this season.